Open for recreation: Year round, except closed to non-hunters during regular big game hunting season. Portable toilets available from April into the Fall. new hiking or biking loops possible. 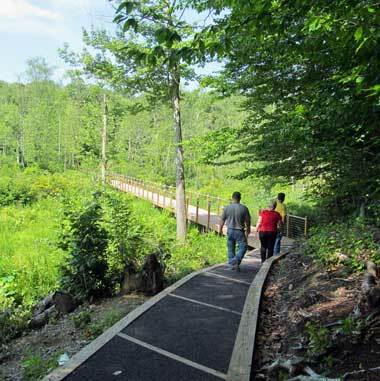 Be sure to visit the new Great Swamp boardwalk and trail on the island. The new boardwalk connects the east and west sides of the Great Swamp and makes some nice hiking loops possible. Directions to the new boardwalk: From Ridge Road parking lot: Head south on Maple Ave., after about 1.4 miles, there will be a sign on the right for the Great Swamp walkway. Turn right and continue a half mile to the boardwalk. Horseback riders will find a place to tie up their horses before the entrance to the boardwalk. You can also reach the west side of the boardwalk via the Schofield Lane Trail, head south on the trail, there will be a spur trail heading off to the left. Total distance is less than three miles. There is a hitching post on the west side of the boardwalk as well. Note: Those who need to drive to the parking lot at the east end of the boardwalk will need a permit that allows access for people with disabilities. (MAPPWD permit). The permit is free. When your permit application is approved, you will receive the combination to the locked gate on Maple Rd. Unless specifically posted as foot trails, all trails on the property are multiple use trails. Purchase a Trail Supporter Patch to provide funding for maintenance of trails and related facilities. The trails on the map are identified by letter. Maple Avenue to Weed Road travels through meadows, old farm woodlands and fields. 1.3 miles. 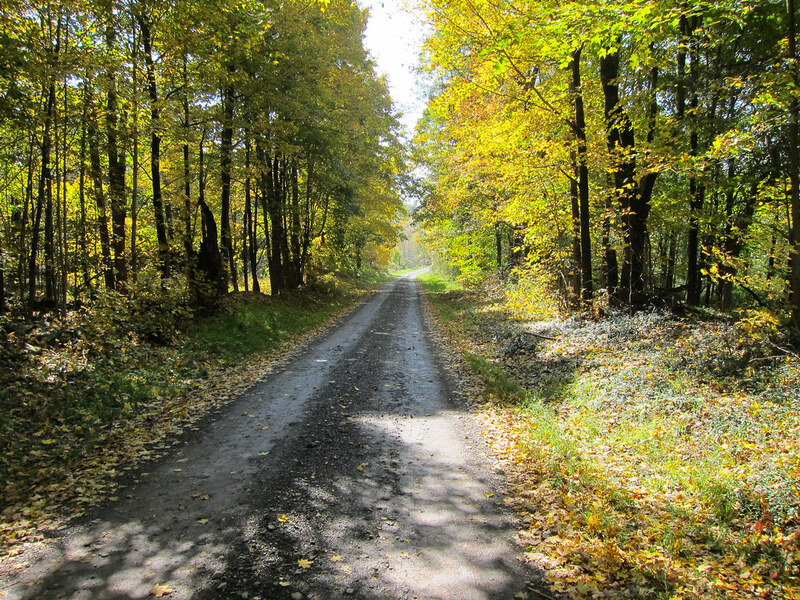 New Road to Barron Road South travels through farm fields, woods and 2 ponds. 2.9 miles. New Road to Barron Road North travels through dry woods, cedars, pines and under power lines. 1.3 miles. Orlando to Barron Road travels through wetlands, moist woods and under power lines. 1.3 miles. Pittman-Robertson Pond Road travels along a one-lane farm road, fields, a pond and through woods. 1.0 miles. Windsor Woods to Ridge Road travels along an old road through woods. Seasonal flooding. 1.2 miles. Windsor Woods to New Road travels through deep woods and hemlocks. 2.0 miles. Scofield Lane Trail travels through disturbed woods and on a ridge above a swamp. 2.0 miles. Raincoat Factory/Lindsay Road Loop travels through woods, fields and near 2 ponds. 1.4 miles. Restoration Pond and Beaver Pond Farm Lane is for vehicles by permit. 0.8 miles. Buchanan Hill Trail includes the highest point in this forest at 658 feet and travels through fields and forest with views and a pond. 1.8 miles. Armstrong Lane wetland and farm trail travels through a wetland and former farm woods. 0.5 mile. Stewart State Forest features seven larger ponds and many smaller ones for fishing. The deepest are 6-acre Whalenburgh Pond, 3-acre Wilkens Pond, and 2-acre Rowes Pond. The smaller ponds offer warm water fishing for bass, sunfish, shiner, bullhead and perch, with a larger selection at Tenny's, including eel, carp, crappie and pickerel. New York State fishing regulations apply. Electric or non-motorized vessels only. Stewart State Forest is one of the most popular hunting destinations in the state. Each year, thousands of sportsmen and women flock to Stewart to take advantage of its diverse habitats and abundant game populations. White-tailed deer and ringnecked pheasants are the most commonly pursued game species at Stewart. However, the area also provides high-quality turkey, waterfowl, rabbit, squirrel, and furbearer hunting. Trapping is allowed in season. Trappers may access the area by motor vehicle from October 1 to December 31 between one hour before sunrise and one hour after sunset. Trappers must not park in designated hunter parking areas. All hunters and trappers must comply with all applicable State regulations and those specific to Stewart State Forest. Stewart State Forest is open to the public during the small game and special big game (archery and muzzleloader) hunting seasons. However, access during the Regular Big Game Season is restricted to licensed hunters and trappers for the purpose of hunting and trapping. Licensed hunters and trappers can gain vehicular access to the interior road network and internal parking areas through the Weed Road gate from October 1 through December 31 between one hour before sunrise and one hour after sunset (road and weather conditions permitting). Vehicle access to the interior of the area is also permitted for participants in the statewide youth pheasant hunting weekend (the weekend immediately preceding October 1). All other users are prohibited from accessing the property by motor vehicle unless permitted by the Department and must park in an exterior parking area. The Department and Orange County Federation of Sportsmen host an annual Youth Hunting Day on the 4th (fourth) Saturday in October. We ask hunters to be accompanied by a junior hunter (ages 12-15) when hunting the property during this weekend. Reservations are required for the first two days (Saturday and Sunday) of the Regular Big Game season. To make a reservation, call Tuesday, 11 days before opening day, beginning at 8:30 AM. Only one reservation will be accepted per phone call. The telephone number to make a reservation is 845-256-3095. DEC staff will be at the hunter check station on Weed Road one hour before sunrise to check in hunters on mornings when reservations are required. Hunters must claim their reservations by 7:00 AM. Unclaimed reservations may be reassigned after that time. Vacating a parking area after 8:00 AM will result in forfeiture of a party's reservation for the remainder of the day. Nighttime furbearer hunting is allowed in season. Night hunters, however, are prohibited from accessing the interior of the area by motor vehicle and must park in one of the peripheral parking areas. Hunting for all species is allowed in season; however, vehicle access to the interior area is prohibited. Hunters and trappers must park in one of the peripheral parking areas and access the area on foot, bicycle, horse or snowmobile. Special permits are available for people with disabilities to access the area with a motor vehicle. See Rules and Regulations section for more information. Camping is only allowed by permit in specially designated group camping areas. Required camping permits are issued by Forest Rangers (845) 256-3026. The permit must be obtained prior to set-up. Camping is prohibited from the first day of the early bowhunting season in the Southern Zone to the last day of the late muzzleloading and bowhunting season in the Southern Zone. Horses are allowed on all public roads and trails except the Orchard Trail, Beaver Pond Trail, Rock Wall Trail and the boardwalk over Great Swamp. Snowmobiles are only permitted on trails designated and marked by the department as a "Snowmobile Trail" and only when the trail is completely covered with snow and/or ice; and on frozen lakes and ponds when access to same may be gained by public highways lawfully designated for snowmobile use, or by trails designated and marked by the department as a "Snowmobile Trail". Mountain biking is allowed on designated trails and multiple use trails. Stewart State Forest is a New York State Watchable Wildlife site and is a one-of-a-kind place for animals needing transitional habitats - birds and butterflies that love grasslands and bushes, turtles and snakes that love open sandy fields, and frogs and salamanders that love small wetlands surrounded by woods and fields. The boardwalk over Great Swamp and the parking lot closest to it on Great Swamp Road are both accessible. In addition, designated roadways on Stewart State Forest are accessible by car for people with disabilities through the Motorized Access Program for People with Disabilities (MAPPWD). A permit must first be obtained from DEC. Special arrangements must be made to obtain combinations for entry at selected gates. 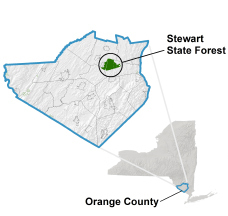 Stewart State Forest is in northeast Orange County west of Newburgh and Stewart International Airport. There are numerous parking areas located throughout the state forest - see map for locations. The general coordinates for the state forest are N41.490578, W74.16358 (Google Map - leaves DEC website). Take New York State Thruway Exit 17 or the Thruway exit from I-84. Follow signs to the Airport and continue west on Routes 207/208 to access the southern border of the property. To access from the north, take Route 17K to Ridge or Barron Roads. Parking is available east of Drury Lane (Rt. 747) along Route 207 (N41.480865, W74.117509). Google Map (Leaves DEC website). You can also access Rt. 747 from Exit 5A on I-84. All users of Stewart State Forest must follow all State Forest Use Regulations (link leaves DEC website) and should follow all Outdoor Safety Practices for the safety of the user and protection of the resource. No person shall operate or possess a mechanically propelled vessel other than an electric powered vessel on any water body on the property. No person shall possess or discharge a rifle or handgun on the property, with the exception of .22 caliber rimfire handguns. Camping is by permit only and limited to designated sites. The permit must be obtained prior to set-up. Camping is prohibited from the first day of the early bowhunting season in the Southern Zone to the last day of the late muzzleloading and bowhunting season in the Southern Zone. No person shall operate or possess a snowmobile except: (1) on trails designated and marked by the department as a "Snowmobile Trail" and only when the trail is completely covered with snow and/or ice; and (2) on frozen lakes and ponds when access to same may be gained by public highways lawfully designated for snowmobile use, or by trails designated and marked by the department as a "Snowmobile Trail". No person shall kindle, build, maintain or use a fire except by permit from the Department. No person shall operate a motor vehicle on the property, except: (1) persons possessing a permit for such use from the Department; or (2) licensed hunters and trappers entering the area between one hour before sunrise and one hour after sunset for the purpose of hunting or trapping from October 1 to December 31, except when unsafe conditions prohibit such access; or (3) adults accompanying youth pheasant hunters participating in the statewide youth pheasant hunt. Any person hunting must park their motor vehicle in a designated parking area and only then if the parking quota for that parking area is not filled. Crossing of roads while hunting is prohibited. No person shall hunt or trespass in areas posted as restricted areas, except as permitted by the Department. No person shall enter Stewart State Forest during the Regular Hunting Season for deer as provided by Environmental Conservation Law section 11-0907, except for licensed hunters and trappers for the purpose of hunting or trapping or by permit from the Department. No person shall enter Stewart State Forest during the first two days of the Regular Hunting Season for deer without obtaining a reservation from the Department prior to entrance. The vehicular speed limit on DEC roads is 25 mph. The annual Candlelight Tour of Newburgh architecture will take place this year on Sunday, December 14th. The self-guided tour taking will include over a dozen decorated homes. The authentically decorated 1830 Captain David Crawford House will start off the tour. The house circuit features a diverse assortment of public and private spaces, including mansions, structures in rehabilitation process, new construction, architectural gems, and some of Newburgh’s most important landmarks. An element of the Historical Society’s mission is to promote an appreciation for the region’s architectural significance. The annual Candlelight Tour of Homes showcases Newburgh as a center of architectural variety and beauty. Admission: $30 Admission. Save $25 with advance purchase. Tour Booklet: A guide booklet and a custom map will be provided to add historical context and enrich the visitor experience. Directions to the elegant Captain David Crawford House. For more information please call (845) 561-2585. The Newburgh Jazz Series attracts over 15000 jazz enthusiasts to the Newburgh waterfront each season. Now in its 5th year, these concerts continue to help make Newburgh a hot spot for visitors, shoppers and restaurant goers. States Aquanetta “Ferry Godmother” Wright, the Series creator and producer, “The Newburgh Jazz Series is a great project to support because it helps businesses and supports community but we need everyone’s help to keep it going. This is one partnership that will bring music to ears for years. Opened in 1909, the New York Central Railroad Station at 35 South Water St. in Newburgh handled huge numbers of passengers amidst a then-bustling commercial center. The building is the only remaining railroad station of the four that once served both passengers and freight transport. West Shore Railroad was founded in 1883 to compete with New York Central Railroad, which offered service east of the Hudson River. When West Shore filed for bankruptcy in 1885, New York Central acquired its operations on the west side of the river. The 1909 station boasted a red-tile roof, arched windows, Flemish bond brick exterior and a lobby that featured marble floors, bronze staircase railings and ticket windows with bronze grating. It is close to where Newburgh's Union Station once stood. "Union is generally the word that you put on a station when it is being used by more than one line," said Mary McTamaney, the City of Newburgh historian. "The Erie, West Shore and even the New England-Connecticut lines would have transferred people and freight through Newburgh." Upon opening, the New York Central station experienced a flurry of activity, serving commuters traveling south to jobs at West Point and others riding north to work at local brickyards. Many local residents routinely traveled by rail to Newburgh to attend performances at one of its eight theaters. "Newburgh was the cultural hub for the Hudson Valley in the 1920s, '30s and '40s, and people came all the time to see vaudeville, theater and motion pictures," McTamaney said." "We had trolleys that ran adjacent to the railroad tracks that would pick up passengers at the station and take them to uptown Newburgh, New Windsor and even down to Harriman, which was a big rail hub at that time," she said. As automobile use grew and superhighways were built, rail travel decreased. The last passenger train departed Newburgh in 1958. In 1970, Conrail, owner/operator of the now-dedicated freight line, removed one set of tracks in Newburgh to decrease its tax liability, based on the length of track maintained. Urban renewal during the 1960s and 1970s also took its toll on the station district, which saw a number of shops, restaurants and hotels torn down. Long vacant, the station suffered the effects of nature, neglect and vandalism. A fire in 1992 and another in 2008 further damaged the structure. In 2009, the station got a new life when Newburgh native Ray Yannone purchased it and began to restore it to its original luster. Last month, its first tenant, Railroad Playhouse, opened the station's front doors to the public. "We've always felt that not only is the station itself historically significant but its location is the gateway to the waterfront for Newburgh," said Nancy Billman, president of the Newburgh Preservation Association. "We're thrilled that it has finally been restored." Dateline appears every Wednesday. To suggest a topic, call 845-437-4834. Reach Anthony P. Musso at railcommute@aol.com. NEW YORK — Officials say they plan to build a three-mile long tunnel to divert water from a leaking aqueduct that brings in half of New York City's drinking water from upstate reservoirs. City Environmental Commissioner Cas Holloway announced Friday the tunnel will run east from Newburgh in Orange County, under the Hudson River to the Town of Wappinger in Dutchess County. Up to 35 million gallons of water a day have been escaping through cracks in the 85-mile-long Delaware Aqueduct. The leaks were first discovered in 1988 and have caused chronic flooding in Wawarsing, about 100 miles north of New York City. Construction of the bypass tunnel is to begin in 2013 and be completed by 2019 for a cost of about $1.2 billion. The leaking portion of the aqueduct will then be sealed.